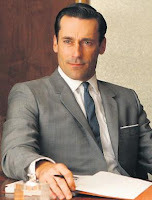 I've been thinking about changing my personality, to emulate Don Draper, lead character on the hit AMC series, "Mad Men" about ad executives from NYC in 1960. Most noticeably, the dude is always calm, and speaks intentionally. His personality commands attention. So, why shouldn't I emulate this? Because it's not "me"? Our personalities subconsciously evolve over time to adjust to our circumstances. We intentionally rid ourselves of bad habits because of how they are received. Why shouldn't I forcefully adjust my personality in order to be more successful?